What a fun meal! I am going to adapt this idea to all kinds of different fillings. Meat pies, or pasties, have a long tradition. When Cornish miners migrated to Michigan’s Upper Peninsula in the 1800’s they brought this meat pie recipe with them. It was later adopted by the wave of Finnish miners who followed. It was easy to eat while underground. The miners reheated their hand pies on shovels set over mining candles. I have mentioned before that David’s Mother’s family were Finnish and settled in the UP. Their last name was Syrjanen. David’s Grandfather Gus Syrjanen founded the Trenary Home Bakery that is still in operation today. It is known for its Trenary Toast. There is also a family connection to designers and architects Eliel and Eero Saarinen. When we were in the UP researching family history we enjoyed eating pasties at several small restaurants. At the time, David did not love them, but the version I made this time was a real hit. It was probably the hot chicken sausage that did it for him. 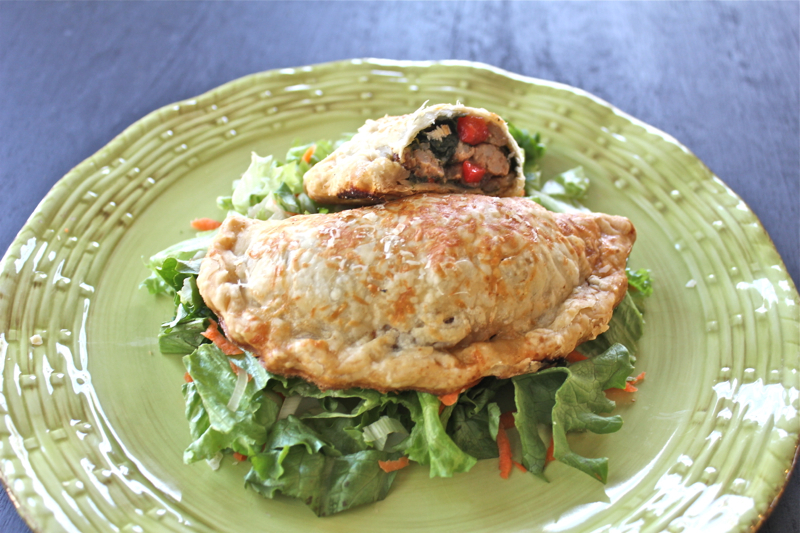 Most pasty recipes use ground beef and potatoes, which can be rather bland. This was very tasty with the sausage, onions, red bell peppers and spinach. The crust was made from Pillsbury pie dough so was easy to assemble. You could make your own pastry but I needed a quick dinner the night that I made these. They were perfect over a tossed salad. Pasties or hand pies are so versatile. You can fill them with anything. How about a Mexican filling with ground beef, cumin, salsa and cheese. Or make it vegetarian with black beans and cheese. My DIL Kristen made a version using pizza dough, seasoned chicken, sour cream and cheese. There are so many possibilities. Heat a large nonstick skillet over medium-high heat. Add oil. Add potatoes, bell pepper, and onion to pan; saute 4 minutes or until onion begins to brown, stirring frequently. Add sausage; cook 4 minutes or until browned, stirring to crumble. Stir in spinach; cook 2 minutes or until spinach wilts. Stir in basil, crushed red pepper, and salt. Remove from heat. Cut dough into 4 equal portions. Roll each portion into a 5-inch circle. Spoon about 1/2 cup sausage mixture on half of each circle, leaving a 1/2-inch border. Fold dough over sausage mixture until edges almost meet. Bring bottom edge of dough over top edge; crimp edges of dough to form a rim. Place turnovers on a baking sheet coated with cooking spray. Combine 1 tablespoon water and egg white in a small bowl, stirring with a whisk; brush evenly over dough. Sprinkle about 2 teaspoons cheese over each turnover. Bake at 400 degrees for 18 minutes or until golden brown. Let stand at least 5 minutes before serving. It’s such fun to look into one’s family history. Your pies are so crispy Penny. At first glance I thought they were fried, but pleased to see that they were baked. I gave up frying a long time ago, primarily because I wasn’t good at it and now I’m glad I never mastered it. Great meal over salad for our chilly nights. I agree Sam. There are very few things that I fry anymore. Sometimes coconut shrimp. These pies baked crispy and good. Like Sam..we hardly ever fried.. and have not in at least 10years. I have a beautiful fryer that was a gift from a freind.. But we just aren’t fryers. These do look good and so special. So many nationalities have stuffed little types of pasties..such as empanadas..toutières etc..
You are right Monique; so many pastry pies. I am thinking calzones would be good too. 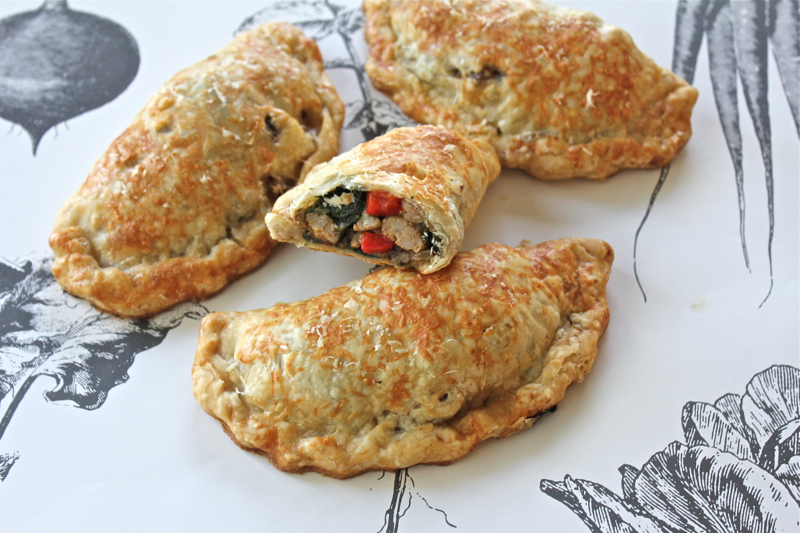 We had ate first pasties in Sep 2013 and I enjoyed them but I know I would like your kicked up version even better and using the purchased pie dough makes it more appealing for me to try them. It does make it easier Larry. I pinned these Penny. I think they will make a great lunch minus the shovel. 🙂 I have only fried once in 26 years. The smell hung in my stairwell for a week, that did it for me. I have often thought I would get a fryer and make things on the patio, but have yet to act on it. btw, love your green green plate. Thanks Madonna. I am a plate junkie. Those are Tracy Porter plates that I got on sale. I love pasties! Yours sounds wonderful and I love that you made it easier by using ready made pie crust. Kent and I love fried food, but know that it is not good for us so we splurged this Christmas and bought a hot air fryer at Williams-Sonoma. It is wonderful! It “fries” with hot air! I think the hot air fryer is a good idea Penny. You’ll have to demonstrate it to me sometime. I’m so glad you mentioned someone using pizza dough, saved me having to ask you that question. Can’t wait to try them. Thanks! Kristen’s turnovers with pizza dough were really good. She used the pizza dough in a tube. Hi Penny..I did a search.. vintage herb scissors.. and many came up on images.. Thank you Monique. I will check them out. I love bloggers like you who are so willing to share. Nothing I like better than a N. Michigan pastie! 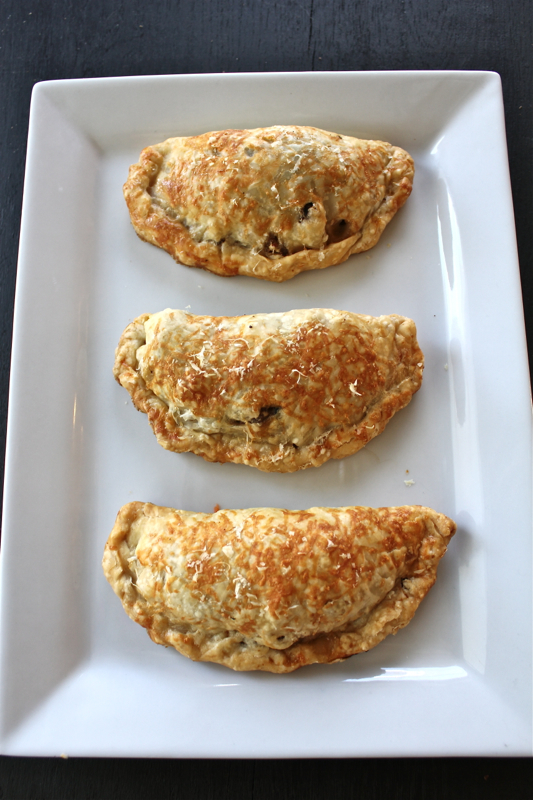 There was a bakery in Petoskey that had the best pasties I’ve ever tasted…tried to copy, failed. Will try yours, Penny. They look fabulous. Baking is the only way I’ve ever made them. How interesting that you went to the Cranbrook school. I have always been fascinated by the Saarinens. The St. Louis Arch is amazing, as are the furniture pieces. Our Son wanted to be an architect; he had both artistic and mathematical talent, but chose computer engineering instead. I can see why David would like your version, they sound delicious. What brand of chicken hot Italian sausage do you use…I don’t think I’ve seen it here. Publix has a “Greenwise” (organic) Italian chicken sausage in their stores. It comes in mild and hot flavors. We used the hot. These looks so much better than the ones I made as a newly wed. The recipe was from one of the Time Life Books (Cooking of the British Isles). They were terrible. I don’t know if it was because I was a novice or the recipe wasn’t a good one. I am now tempted to try again!! Thanks Bonnie. I made a few less than stellar ones in the past too. Glad to see you here. These would be great for picnics. 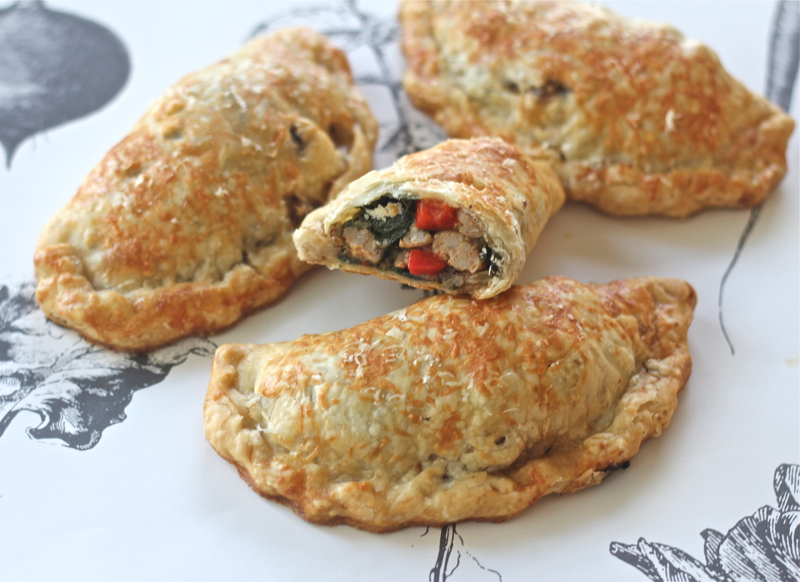 I agree that most pasties can use a little spice and these sound wonderful… sausage and peppers are favorites. Thanks Katie. I can hardly wait for picnic season. This post was published by Penny on February 21, 2015.